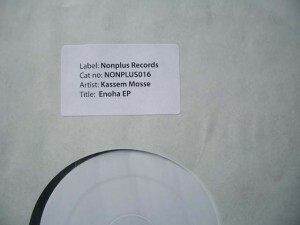 A test pressing of Non Plus Records presents a new EP by Kassem Mosse, mainly known for his much-praised Workshop and Mikrodisko releases. Often difficult to file under any particular subgenre, Gunnar Wendel is an electronic artist who continues to pursue cross-breeding of techno, house, electro and others. The nine-minute-long “Enoha” is a linear trip with strong percussive elements and bumblebee bass, thus carrying clear floor potential and partly reminding of what Cheap And Deep Productions has done. “GS02” is a laid-back electro cut that floats in the wake of Doctor Blowfin’s Water Cruiser, surrounded by electric stingrays and jellyfish of the warm seas. B-side’s “Inswanna” returns to rhythmic textures of the title track, pumping your veins full of fat and dry percussion, the greats of Chicago would have been proud of. For the end comes electro-flavored “Sleepworking”, the most sentimental cut of this EP with modulating bass and melodic loops. A well-balanced EP that confirms Kassem Mosse being a rolling stone that gathers no moss.